I hope everyone enjoyed their long weekend! We get a bank holiday Monday here for May day. I got someone to fill in for me at the organ on Sunday so I had three whole days off. Unthinkable. It turns out that I really needed it. We didn’t really go anywhere but we did lots of little things. 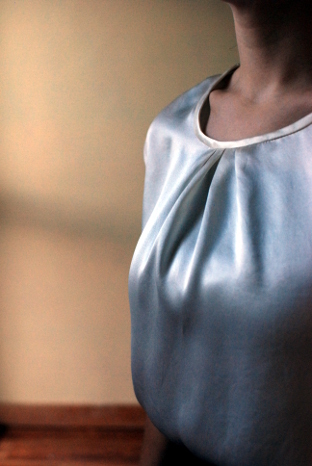 It doesn’t feel like I did a lot of sewing but I must have, because I finished this blouse. I’m putting it with a finished-in-April skirt. 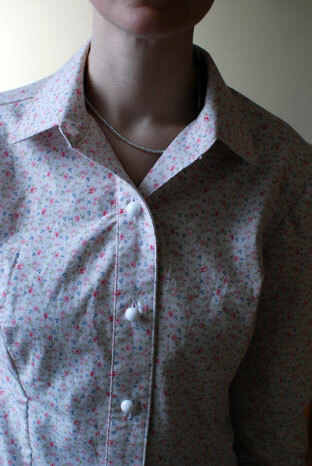 The blouse is a vintage pattern that I made again with modifications. The skirt is self-drafted. About the blouse! I used 2m of Tilda cotton from Rubanesque. It is so pretty I literally became weak at the knees when I set eyes on it. I knew it had to be a spring blouse. I modified the collar to make the tips rounded because I felt it would suit the print better. I also adapted the cuffs to make them rounded and open. I had to pare down the shape of the sleeves because I didn’t want them too wide without a placket and closure. I sacrificed the tidiness of seaming the sleeves and then enclosing the seam into the cuffs for sewing the cuffs flat with all the top stitching and them seaming the sleeves. It looks fine from the outside. If I were to do it again, I would probably suffer through topstitching the cuffs with an already seamed sleeve. The buttons I salvaged from another unwearable blouse. Now, for the skirt! I dug out my drafting notes from five whole years ago and drafted this up. I pity my younger self as I took the drafting course without ever having sewn any sort of clothing! It made a WHOLE lot more sense this time around. Unfortunately, when I was cutting out my pattern pieces I managed to chop off the side seam allowance and only discovered when I could barely get the skirt on. Thankfully I was able to salvage it through some manipulation of the darts but gosh! Never again! I basically made up the pleat bit by holding my muslin up against me and saying, ok, I’d like my pleat to go from about here to here and be about this long. Turns out, that’s kind of the way to do it. My mum helped me get my pleat to behave itself. I did myself no favours in the way I’d hemmed it but I will know for again! I actually made this skirt to go with my cape. The skirt I originally made was just the wrong shape. As you can see, it goes very well now with the straight skirt. It is a peculiar outfit! It is a bit dull for a bright May day such as today. Maybe later in the summer with hot pink tights? I should probably just wear the cape with jeans also – although I put it on Sunday and Alb asked me if I was going to meet Batman :/ He does not see capes as a proper item of clothing unless for dressing up. Isn’t that what clothes are for anyway?! 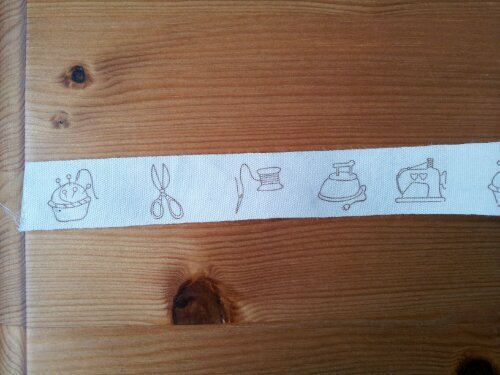 I bought some tracing paper in The Cloth Shop at the weekend and while there, I spotted this fun ribbon. I think I’ll use it with one of the awesome fat quarters I bought at Pippa Blue to make a cover for my overlocker. It was only €1.80 for a metre. And speaking of bang for your buck, I picked up some dark brown embroidery floss and one of those plain canvas totes from Aldi. 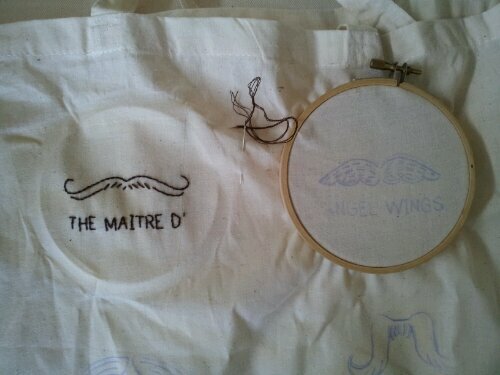 Last night, I printed off the free moustache sampler from Sublime Stitching and got started. Just in time for Movember! My amusement, clearly, is as endless as my embroidery floss. I stalled out on the blue top I’m making because I don’t have enough interfacing for the collar. So I dug out the tracing paper and got started on something I’ve been meaning to do for ages: revise my old skirt drafting notes. I got a straight skirt drafted and mocked up in about an hour. I love wearing skirts but I’m bored making the same pattern so I have a few simple ideas I want to draft up. 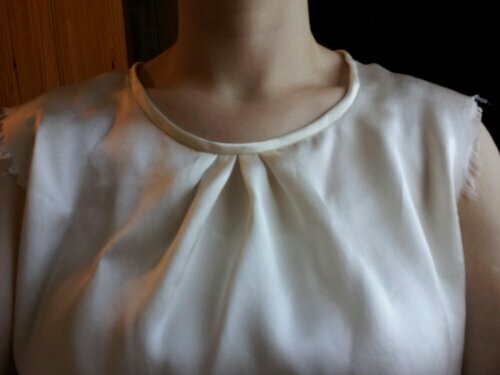 Because I got that done so easily, I dug out an old blouse I’d stopped because a detail wouldn’t come right for me. This was obviously user error because it was easy to solve and I should have a neat little navy blouse with white collar for the weekend. I am in love with mitered corners. 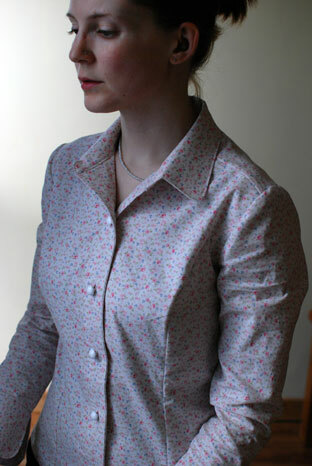 Yet another simple technique from 1, 2, 3, Sew. 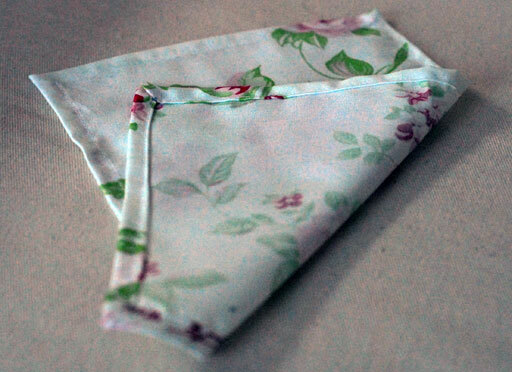 I had two small squares left over in this fabric but I ruined the first one by making four 65-degree corners. This, on the other hand, is most pleasing. I acquired some fat quarters and am sewing a simple present using this technique. Perfect for those days when you want to make something but don’t really want to think too hard (which was yesterday). I got a pile of navy Karisma from the Constant Knitter yesterday in the post and cast on immediately for my Dad’s Christmas jumper. He has worn the first one to death. The second was much loved but went missing in the hospital. If someone had the nerve to steal it – well, I hope they’re too warm. The following months can only be described as a mourning period and whether he’ll admit it or not, I know he wants a jumper for Christmas. 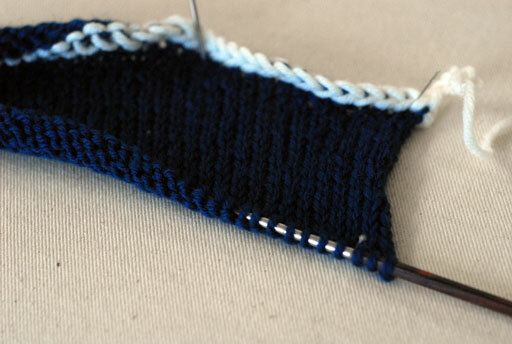 On the upside, I have all my notes from the last one so casting on was simply a matter of making a swatch and jotting down a few preliminary sums. I have a month to the day for this one so time is of the vanilla essence. I finally pushed on with my top pattern yesterday evening. I move slower than if I were taking a class because sometimes, I feel like I’m reinventing the wheel a little bit. I get stuck and have to think about things, look back over my old notes and try to figure it out for myself. Which, though slow, is probably better in the long run. This isn’t going to be perfect. I think the armscye and waist shaping will be ok but the neckline, I’m not so sure about. 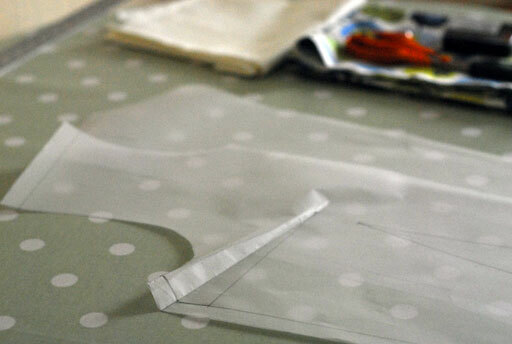 Hoping to test on muslin tomorrow. Thank you all for weighing in on the skirt issue! I didn’t realise so many people didn’t like school uniform skirts. My mum used to dress me in a kilt, when I was quite small, that was straight across the front and pleated around the back. I suppose I had that idea in the recesses of my mind. 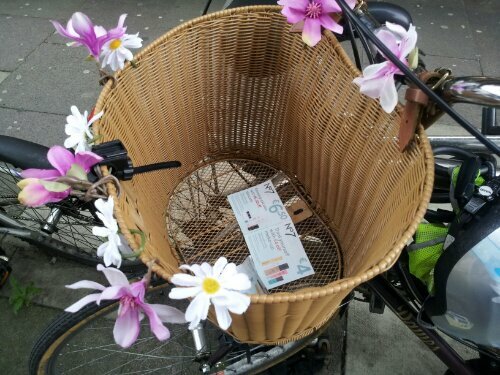 In the end, it was Mary L’s comment that the very pleated one would be impractical for cycling that swayed me! 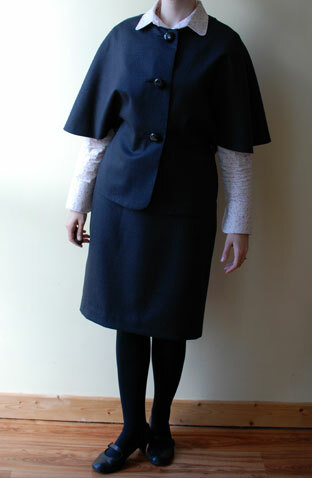 However, with the more A-line skirt, I’m not sure how well the bulk of three pleats would sit. It would be pretty heavy. I have subsequently come across this version which I think is a nice compromise and satisfies that bit of nostalgia, too. The more I think about it, I like the idea of a straight cross-over front with the movement of the pleats around the back. I get to keep the traditional elements of the buckles and the kilt pin. And, as you can see in the link above, the pleats in the back are tapered down from the waist band a fair bit so there’s a nice tidy shape without the extra hassle of a yoke. So I’m going to sew the top first and then start the skirt. Exciting!